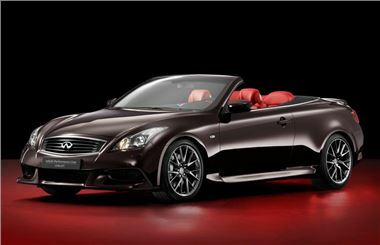 Infiniti will unveil its Infiniti Performance Line (IPL) G Convertible concept at the Paris Motor Show - a big hint at future performance models from Infiniti. While it's labelled as a 'concept', it's essentially a production ready model but Infiniti says it will make a decision as to whether to build it after the motor show. The IPL G Convertible uses the same 3.7-litre petrol V6 as the standard G Convertible, but power is boosted to 338bhp - 18bhp more thanks to a high-flow dual exhaust system. Peak power now comes in 7400rpm (compared to 7000rpm in the standard model) while maximum torque increases from 360Nm to 374Nm. The running gear has been upgraded with sports suspension, 10 per cent stiffer springs and recalibrated dampers, along with a body that sits a little lower. The top speed of the de-restricted concept car, which has a seven speed automatic transmission with magnesium paddle shifts, is more than 168mph, with 0-62mph coming up in under 6 seconds. The show car comes in a new Malbec black - a pearlescent black paint with red hints - and Monaco red leather interior complemented by unique cabin inlays apparently inspired by the craftsmanship of samurai armour. 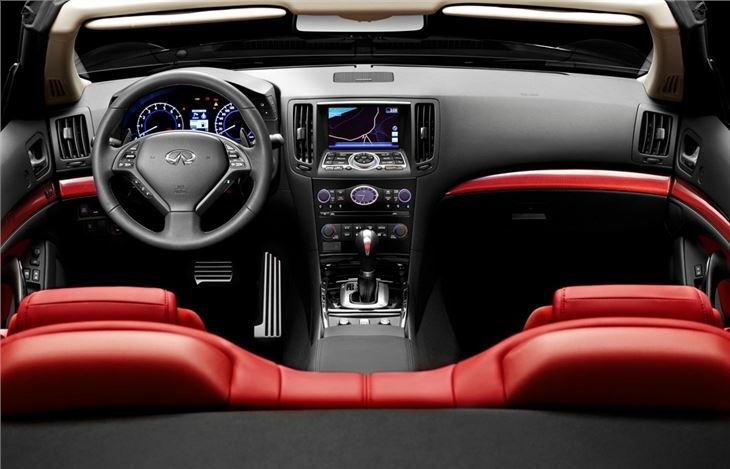 The interior trim is unique to the Paris concept with a centre console finished with black lacquer while the dashboard area above the glovebox and doors are adorned with KACCHU, the name given to the armour used by samurai in the Middle Ages. 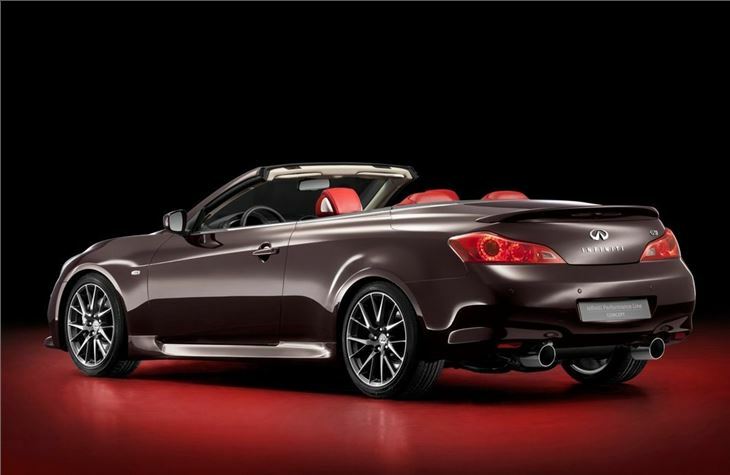 The Paris Motor Show debut follows on from the unveiling in the USA in August 2010 of the first production Infiniti Performance Line variant, the G Coupe, with which the IPL badge has been launched in North America. The IPL G Cabrio concept shares many of the IPL G Coupe's features with 19-inch split-rim seven-spoke graphite-look alloy wheels, a new front end design and a blacked out grille. There are sculptured side sill extensions and a slightly lowered body to highlight the purposeful new stance. A body-colour bootlid spoiler, based on the aerodynamic design of that fitted to the IPL G Coupe is fitted to the rear. Along with the extra performance are are features such as noise-cancelling technology, head restraint-mounted "personal" speakers, seats with internal heating and cooling and adaptive climate control. The 13-speaker premium sound system is by Bose while suggestions on where to visit, stay or eat and drink are sourced from the Michelin Guides directly into the 30GB hard disk drive navigation.